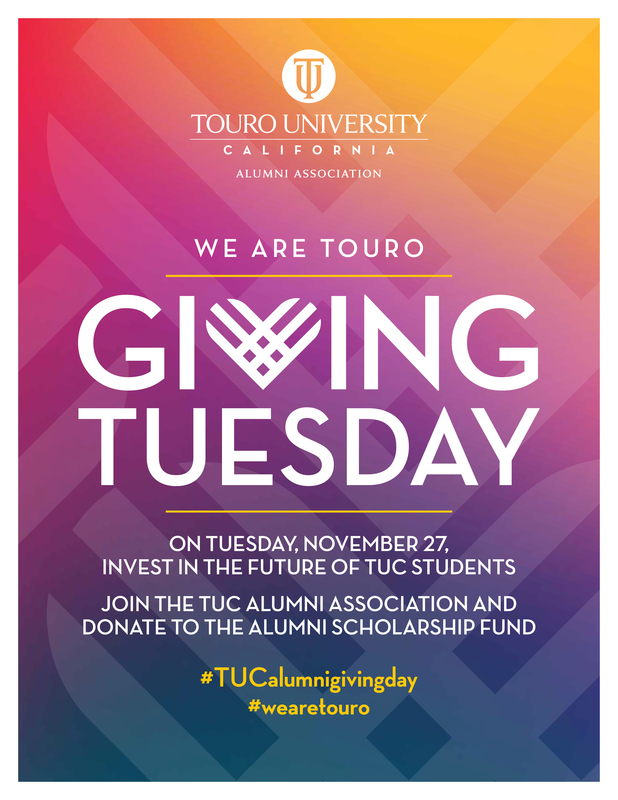 On Tuesday, November 27, 2018, Touro University California will participate in #GivingTuesday, a global day dedicated to giving. This year, our campaign supports the Alumni Association Scholarship Fund, which aids deserving TUC students by providing scholarships to assist with the cost of their education. The Touro University California Alumni Association Scholarship was introduced in 2012 by the TUC Alumni Association. $1,000 scholarships are awarded to full-time TUC students who demonstrate leadership skills, commitment to community improvement, and good academic standing. Give a little, make a big impact. The Touro community appreciates your generosity on this national day of giving as a vital part of our campus. Remember to share your support across all of your social platforms with the hashtag #TUCGivingTuesday on Facebook, LinkedIn, Twitter, Instagram, and YouTube!